my sirius radio is being a pain in the ***. when i turn it on on certain days it'll be on or just sit on "Acquiring" for the rest of the day. anyonelse know what the deal is? Last edited by ShinkaTeen; 11-18-2008 at 08:45 PM. could be the antenna wire has broke. you cant splice it, must replace the whole antenna. when i heard that i thought i was gettting ripped off but it seems to be true. sounds like a broken wire yeah. I've seen a few people on here have the same problem. dealership should take care of it. I wish the sirius antenna was more sensitive in general. I hate the way the music stops every time you drive under a bridge. Of course, now that sirius and XM merged, i'm not listening as much anymore because the 5 channels I used to listen to filled with a diverse range of electronic music has become 2 that play the same asstacular house music, and asstacular house remixes of asstacular top 40 singles. I'm seriously considering telling them to go **** themselves. Actually.. I've been having trouble with mine ever since the actual Sirius XM merger about 2 weeks ago.. Mine went out just like yours does. It went out for about 30 hours one time -- and then just came back on one day. and every now and then it cuts out for a few seconds.. and I've had the system for years now and this is the first time it's done it. I just think it's some issues Sirius XM is having getting all their satellites working well together..
Give it a couple of weeks and see if it just gets better. Factory sat radio? or aftermarket? The antennas that come with aftermarket units are crap. I replace at least one a week for customers having the same issue as you. No cuts or breaks in the wire. I think they usually get waterlogged. Supposed to be weatherproof, but when I lift the antenna off the roof and a 1/4 cup of water pours out.... that can't be good. I would get a known good antenna and just plug it in real quick. If the signal pops right in, you've obviously found your problem. I have had this for a year now. I think I figured it out, I will return with the answer. after having satellite for four years it started giving me the same problem..i tried changing the atenna like they said it wasnt that ..i ended up buying another unit and now it works fine...i think it either has to to with the merger or the old unit just burned out over time..with the heat in the car and the vibration..idk..
You have to replace this thing... but the only place i could find it is from the factory. they replaced the reciever but reused this part so it didn't fix the problem. now it works great. Anybody know what this part is called? or the part number? Where is it located? I just replaced my antenna and still have the same problem. It is on the receiver in the trunk or near the head unit in the dash? I have no idea. I wanted to look up part numbers before I started pulling the trunk liner out. By the way, how much was the replacement antenna? Did you buy an oem? It's located behind the trunk liner, above the back of the left wheel. Cost is around $300 for the 04-08's and $200 for the 09-11's. The antenna is included with the receiver. The "installation kit" is seperate, but includes only sticky tape, ty-wraps, and instructions for about $20. Nope. Bought an XM antenna at Best Buy for around $40. It's magnetic and really holds to the trunk lid. The factory antenna (installed at the port or the dealer) was double-sided taped to the deck lid and was a bear to remove (heated it with hair dryer to soften the adhesive). The item in the photo is not located in the left rear trunk. The receiver is there, but not that part. The antenna plugs directly into the receiver. After the antenna install, I did a hard restart on the receiver by disconnecting the battery for 10 minutes, and it seems to have helped. I'll report back after my drive to work tomorrow. That part is not on the receiver in the trunk....not on mine. The antenna is normally installed on the trunk, but the cable goes to the receiver located as I described. To replace the stock antenna, you gotta replace the cable too, since there's no connector on that end. Besides, if it's an antenna problem, it's likely to be in fact a cable issue, breaking where it flexes with the opening/closing of the trunk lid. The proper latest part number for the 04-08 receiver is: 0000-81-G01-B. One perhaps might find an older -A version for less than $300, but any $200 version is likely for the Series II. (Unless something has changed since I did extensive looking 5 months ago, anyone advertising a $200 unit for the Series I, gave a part number corresponding to the Series II) The list price from Mazda is higher, but I found a dealer advertising the ~$300 online, took a printout to my local dealer and they matched the price. If you guys can get over the whole "included in the stock radio" thing, get an aftermarket sat receiver with the FMDA25 adapter. Just as good, if not better, signal strength and sound quality. Plus cool features like recording ability. Play back the song again. Just like DVR for your car. All for less than half the price. If not, I can understand. Just thought I'd remind everyone. 45 minute drive to work this morning and the Sirius worked flawlessly. So, the new antenna and a hard reset of the receiver worked for me. Agree to first order, that aftermarket is both cheaper and better wrt sirius. However, try finding a nice place to put the control head (my ashtray is already full of gauges). Metra + new head unit works, but is mucho bucks plus has other problems. YMMV. Spoke too soon! Damn thing wouldn't work on the ride home. Played for about 19 minutes, and then nothing but 'acquiring'! POS! I pissed and moaned to Sirius about paying for full time service and getting 20% of what I paid for, and they gave me 6 months at no charge, so this 'acquiring' nonsense is just mildly infuriating. My Sirius issues continue. Anybody figure out what this part is and whether it can be sourced apart from the receiver? The sat antenna plugs into it, but it splits into 2 wires that plug into the receiver; one is for 'Sat' and the other for 'Terr' (terrestrial?). When you wiggle the 90 degree connector where the sat antenna plugs in, the signal on my radio goes in and out; I suspect this is where the issue lies. 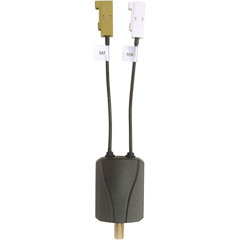 I bought a Terk single to dual antenna splitter from www.myradiostore.com for $9.99 + shipping. The Sanyo OE piece is no longer available or stocked. Installed it last night, and my Sirius has never worked like this before. My guess is that that the dealer install of the Sirius radio package included a 90 degree adaptor for the antenna port on the splitter. The leverage it exerted on the antenna port on the splitter eventually compromised the connection inside the sealed unit (you could twist mine), and the signal to the receiver became intermittent, depending upon how many bumps you hit on the road as the receiver is solidly wire-tied to the chassis structure in the trunk (thus the stick-on foam on the receiver to abate the vibration). I wrapped my reciever in a couple of layers of foam when I reinstalled it, and I deleted the 90 degree adaptor, too.